Niger's Trees May Be Insurance Against Drought For decades, necessity has forced the people of Niger to chop down their valued trees. But recent local and international efforts to plant and protect trees have succeeded. This new tree growth may allow Nigeriens to better cope with the effects of climate change. Gray Tappan uses a "Biltmore stick" to measure the height and width of a tree. Mahamane Larwanou stands by a cleared field. Although farmers normally prune the limbs only, some farmers clear the land for profit. Scientists studying vegetation patterns in the broad, arid region just south of the Sahara desert have discovered that trees are growing like crazy there. And while it's a big unknown whether global warming will bring further drought to this impoverished region, these trees will be one of the things that help people in countries like Niger cope. A huge chunk of Niger is Sahara desert, and what's not outright desert gets just a smattering of rain. You don't expect to see a lot of trees in this land-locked, West African country. But that's exactly what ecologist Mahamane Larwanou and geographer Gray Tappan see when they roll out a satellite photo of central Niger. Both are passionate about understanding why trees are making a big comeback in many parts of Niger . In Niger, trees aren't just aesthetic. They are essential. Ninety percent of the nation's energy comes in the form of firewood. Trees also feed animals, nourish the soil, provide wood for construction, and bear fruit and lucrative products, like gum Arabic. And unlike most crops, trees can survive the inevitable hard times when the climate suddenly turns even drier and more hostile. So to get a closer look at the hopeful trend in tree growth, Larwanou and Tappan pack up a couple of four-wheel-drive trucks with gear, food and helpers and head east out of the capital city. 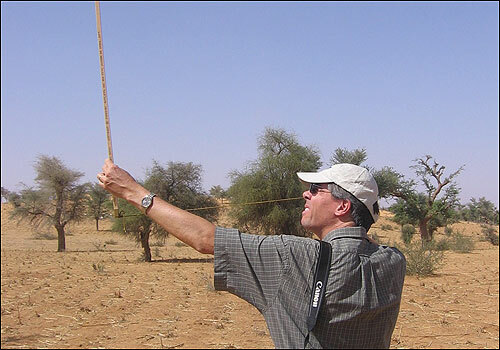 The U.S. Agency for International Development (USAID) is funding a study to monitor tree growth in Niger, part of which involves a two-week road trip by Larwanou and Tappan. As we wind through broad agricultural areas and across rocky plateaus, it's the same thing everywhere: acacia trees, gum Arabic, ebony, tamarind. As we cross a plateau, Larwanou marvels that there's actually greenery dotted around us. "Before, this was an unproductive area," he says. "There was not a single tree, only stones." We descend off the plateaus and make our way into the town of Adouna . Larwanou and Tappan stop on the outskirts of town to measure the trees and figure out how much wood they're producing. "If we know the amount of wood that is being produced, we can figure out a sustainable rate of harvest of the wood for firewood," Tappan says. First they set up their study plot. Then, they measure the height and width of each tree and bush. Eventually, they will be able to extrapolate these readings to measure tree growth over an area of Niger the size of West Virginia. That's a lot of wood. Tappan works for SAIC, a contractor that helps the U.S. Geological Survey run a remote sensing center in South Dakota. He's precise and a bit reserved, especially in contrast to Larwanou, who is everybody's instant friend. Larwanou's face is adorned with tribal markings that look like whiskers. That gregarious quality serves Larwanou well, because the researchers don't just want to measure tree growth. They want to understand what people are doing to encourage trees. And to do that, Larwanou talks to the locals. We wander up a slope overlooking the study plot to talk to three women who have been looking down on us and laughing at the strange activity they see. The women are chopping up a branch that had been lopped off the tree. First, goats and sheep had a chance to eat the leaves. Now the women are taking the rest for firewood. The first thing we learn is that these trees aren't all that old. Oomah, the oldest woman, tell us that, long ago, this area was dotted with trees. But during the early 1970s, there was a horrible drought throughout this region of West Africa and people used the trees to survive. "People suffered in a way that cannot be described. People were displaced by that crazy drought. Those who dared to stay, cut down the trees and took them to the markets to sell," Oomah says. "That was their only way to get food." Even so, the drought killed hundreds of thousands of people throughout Niger and other parts of West Africa . Gray Tappan picks up the story from there. "When the people were hit by a second drought within their living memory," he says, "they realized that they have to consider other options to survive the next drought. Everybody knows that drought is a natural part of this environment here. It is only a matter of time before we see another drought." Aid groups from Europe and the United States knew that trees could help people adapt during the bad years. So they planted trees extensively starting in the 1980s. This explains part of the story. The government of Niger also changed its policies and let local people take ownership of the trees. And that has encouraged farmers to let the trees grow. These days, they prune them for wood rather than chopping them down altogether. "They know the importance of trees," Larwanou says . "If there are no trees here, they are in trouble. That's end of their lives." Here in Adouna, there's an extra twist to the story. Alhaja Ishmaila, brother to Adouna's chief, says that the village had been surrounded by sand dunes. After the trees were cut down in the 1970s, the dunes moved in on the town. The dunes moved so quickly that the people in the village were on the verge of abandoning the town altogether, Ishmaila says. A European aid group volunteered to plant trees to stabilize the dunes — so long as the town's people built fences to keep the trees safe from the camels, donkeys, sheep and goats. Today, the people in Adouna say those trees saved the village. The stories vary from one village to the next, but Tappan says the result is the same: Large swaths of Niger are getting greener. "As we go from village to village, what we are hearing from farmers is they consider themselves better off today than they were 20 years ago. We see less and less migration of youth to cities," Tappan says. "Youth stay because they can actually make a living on the land today." Trees here are really another crop. Farmers generally encourage them to grow scattered throughout their land, so there's still enough space and light to grow grains on the same plot. But Tappan and Larwanou have also noticed a few curious places in the aerial imagery where trees are growing back much more densely. "This is literally a forest — there was nothing there in 1975," Tappan says, looking at the photos. "It is the densest stand of vegetation we have anywhere near this village area." So we pile back into the trucks, pass some nomads who are riding camels, and head out — slowly — across deeply- rutted fields. Across the river, the scene is not at all what Tappan and Larwanou expected. The farmer who owns this land has recently chopped down most of his trees. "This was all forest a year and a half ago, and now look at all of the stumps. They cut everything," Larwanou says. "They burned the soil to avoid sprouting. I am highly disappointed. I am an ecologist, and I would like to see everything green. But the farmer has to eat." He not only needs to eat, he needs to make his land produce more and more food every single year. That's because the population here is growing at an astounding pace, doubling every 20 years. 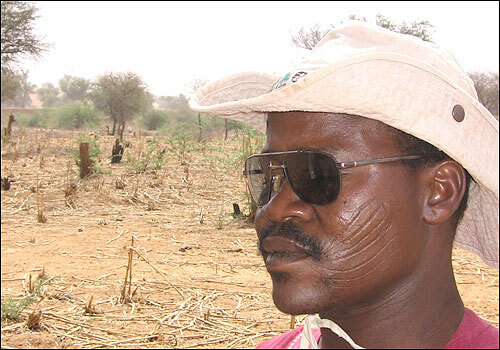 These circumstances are difficult, but Larwanou sees an alternative to poverty's destructive effects on Niger's trees. In today's global carbon marketplace, Niger could receive credit for trees that are soaking up the carbon dioxide produced by rich countries. The World Bank is already funding a few tree plantations in Niger, so the country can earn cash for taking carbon out of the atmosphere. It is hard to see how individual subsistence farmers could benefit from this exchange. But if Larwanou can find a way for all to reap the benefits, that would be yet another reason for the people in Niger to let their trees grow tall.